A great white shark cruises underwater in search of prey. 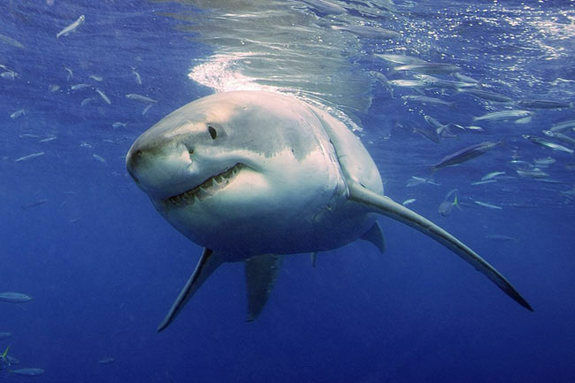 If you thought humans were late bloomers, consider the great white shark. Male great white sharks take 26 years to reach sexual maturity, and females take a whopping 33 years to be ready to have baby sharks, according to a new study. That's decades longer than previous estimates, which suggested that females reach maturity somewhere between 7 and 13 years of age and that males can start reproducing when they're between 4 and 10 years old. Great white sharks are elusive creatures. Most of what scientists know about the much-feared beasts comes from dead animals and anecdotal reports of observations at sea. Since the 1920s, marine biologists' attempting to guess the ages of great white sharks have counted their "band pairs," which are series of rings that alternate between translucent and opaque within the sharks' vertebrae. But exactly why these dark and light patches form as a shark grows wasn't clear. "There are theories: They're laid down because of food, because of light, because of migration. We don't really know," said the study's lead author, Lisa Natanson, a fisheries biologist and shark researcher at the National Oceanic and Atmospheric Administration's Northeast Fisheries Science Center. Until last year, scientists didn't know whether these bands were laid down annually, like tree rings, or whether the rate of their formation changed over time. It is also tricky to count the bands because they aren't clearly delineated, and can look different depending on how the vertebrae are sliced, Natanson said. But in a 2014 study in the journal PLOS ONE, Natanson and her colleagues found a way to definitively age sharks. Well-documented nuclear tests in the 1950s and 1960s caused spikes in the atmospheric levels of the radioactive isotope carbon-14, and the radioactive fallout that wound up in the seas was absorbed by marine creatures. The tissues of today's longer-lived marine animals still contain distinctive carbon-14 spikes that can be tied to specific years. Using this method, the researchers working on that 2014 study found that great white sharks were considerably older than previously thought, with the oldest individual animal in the study reaching 73 years of age. In the new study, the researchers combined the radiocarbon age data with band-pair data from 77 sharks that were captured between 1963 and 2010, and developed a less subjective way to count the band pairs. The team found that band pairs are laid down annually until a shark is 44 years old, and then the counts become unreliable. The researchers also created growth curves for the species by combining age and size data from the captured sharks with existing data on the size at which great whites reach sexual maturity. They found that the great white sharks - at least in the Atlantic Ocean - matured more slowly than scientists had previously thought. In theory, great white sharks' slow-growing population and late sexual maturity could make them even more prone to overfishing because animals who are fished won't be replaced quickly. Right now, however, that's unlikely, as hunting great white sharks is already banned. "A person may fish for white sharks with rod and reel but must remove them immediately," Natanson told Live Science. "There's always going to be incidental catch, but you have to let these things go." The study was published online Jan. 6 in the journal Marine and Freshwater Research. Follow Tia Ghose on Twitterand Google+. Follow Live Science @livescience, Facebook & Google+. Originally published on Live Science.